Trai Hiscock achieved her ambition to become an artist by a roundabout route. When she was at school careers advisors were less than enthusiastic about her artistic ambitions and like many of us she was persuaded to look elsewhere. The prospect of a career behind a desk loomed before her, as did the need to earn a living. However, driven by both a creative urge and a desire for independence she went off in a rather different direction and opened her own hairdressing and beauty business in 1984. She ran this for twelve years while taking a variety of art courses at local colleges. In 1996 she became a teacher of English as a second language and after a couple of years in Mexico and Russia returned to the exotic climes of Bournemouth where she also began to study silversmithing. This led her to establish a teaching studio, which enabled others to develop skills in both painting and silver and to show their work. At the same time her own work developed and she began to accept commissions. Trai now divides her time between painting and silversmithing and teaching. Trai’s paintings are characterised by her love of animals and her slightly warped but affectionate sense of humour. She shares her home with her long-suffering husband John, a 1950s Wolsley and a varying number of dogs. We see her dogs in many of her paintings. John has proved an elusive subject but we have great hopes for the Wolsley. 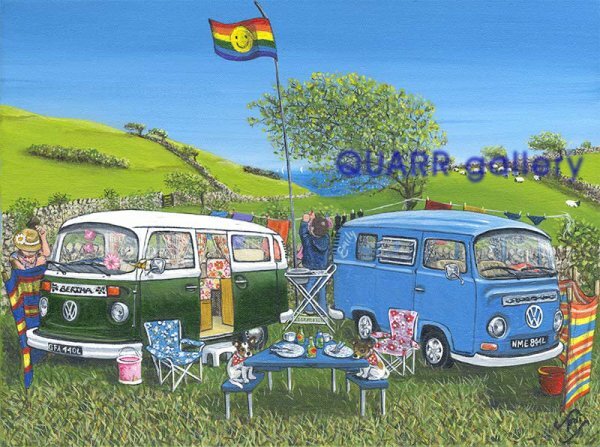 The Dorset countryside and coast form the backdrop to many of Trai’s paintings as do well known landmarks, for example, the Square and Compass. These scenes have a slightly eccentric population, ranging from naked vicars and policemen to distraught children and affectionate retired couples. What they have in common is that as well as finding humour in her character’s predicaments Trai explores relationships and unlikely juxtapositions in a way that is almost a playful reference to the Surrealists who painted in and around Swanage in the inter-war years.